Welcome to Yoga After Baby! My name is Amber (Amrita) Allen, and I am a mother. I am also a yoga instructor with 500 hours of training under my belt. Other titles I hold (and cherish) are wife, pet owner, daughter, friend and gardener. I live in Charleston, South Carolina, but I hail from Iowa. I also have plans of pursuing certification as a postpartum doula. I attained the title Yoga Siromani in November 2009 after completing my 200-hour training in Athens, Georgia, with my teachers Lal Maharajh and Lorrie (Shivakami) Conglose, who run the Vastu School of Yoga. I learned the Rishikesh series of Sivananda Yoga, with the deep concepts that come from Vastu Yoga. My teachers and I adhere to the teachings of Sri Swami Sivananda and the Divine Life Society. We also gain knowledge and insight from Sri Swamis Vishnudevananda and Satchidananda, beloved followers of Sivananda. Recently, I completed my 500-hour training with Lorrie and Lal, deepening my knowledge of the Yoga Sutras of Patanjali, other Vedantic philosophy, anatomy and physiology and asana practice. I also assisted in one of my teachers’ recent 200-hour trainings at Hotel Na Balam in Isla Mujeres, Mexico, which is where they are based. My teachers, Lal Maharajh, and Lorrie (Shivakami) Conglose, and me in Isla Mujeres, Mexico. 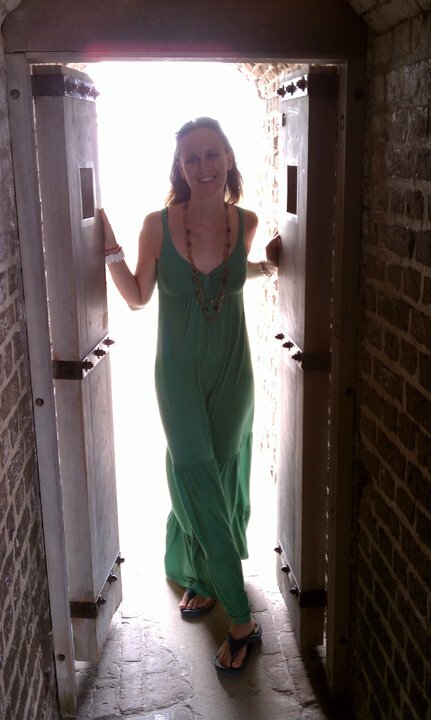 Pre-motherhood, I was a newspaper journalist, working as a reporter and copy editor at metropolitan newspapers such as The Augusta Chronicle and The Times, both in Georgia, to small community newspapers. I hold a bachelor’s degree in journalism and mass communication from Iowa State University and was one of one hundred picked across the country for a prestigious copy editing internship with Dow Jones, Inc. Post-motherhood, I am a full-time stay-at-home mom, house-picker-upper, gardener, playdate wrangler, private yoga instructor and proud wife. So what about Yoga After Baby? Yoga After Baby was born as a project for my recent teacher training, but it was inspired by my own story of motherhood. My daughter was born in 2011, and although I thought I was prepared for her arrival, I stumbled and cried many times as she grew. I was in a new city with not a lot of fellow mom friends, and my husband was busy working at a start-up company. Life seemed very unstable to me as a new mom. Even though my knowledge gained from my 200-hour teacher training helped me, I needed more. I needed a postpartum doula to take care of me. I needed mom friends to commiserate with. I needed a deeper yoga practice, because my body had changed and my mental demands were far greater than I ever expected. 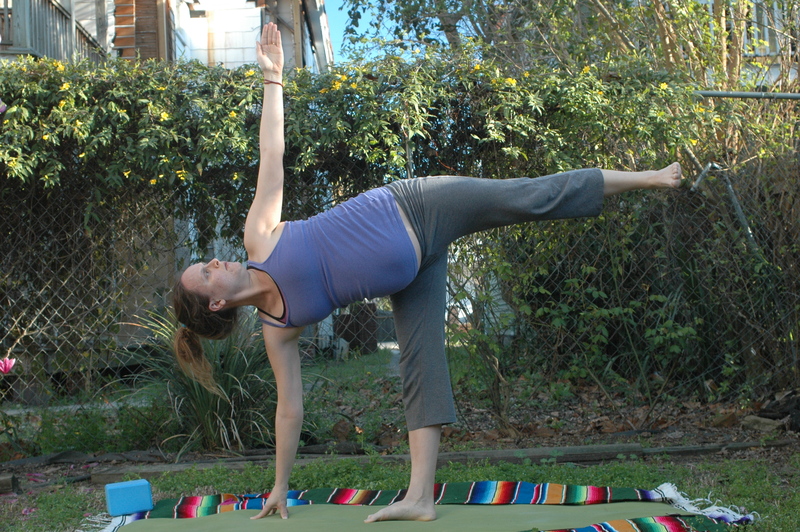 Ardha chandrasana while seven months pregnant with first child. Yoga After Baby aims to guide women and their loved ones through the process of pregnancy, birth and postpartum with the mindful practices of yoga and ayurveda. It is my goal that I can help guide moms down a sometimes difficult path by following the Eight Limbs of Yoga, or ashtanga. With those eight keys, I believe that motherhood doesn’t have to be as scary or difficult. We can be graceful through times that seem filled with tears, potty, poop and tantrums (whether our child’s or ours). My work is geared toward moms of all shapes and sizes, for those who experienced a vaginal or Cesarean birth, for those with singles or multiple children, and for those of any (or no) religion.